First of all, this article is equally relevant to cat families but refers to dogs simply because it is written based on facts found in the Dogs Trust 2016 survey. Is the Dogs Trust survey relevant to cats? Definitely, and while there is no intention to insult cats we ask cat families to change the word ‘dog’ to ‘cat’ in places. Still in doubt about this article’s relevance? Consider this, if a stray dog is taken in without a tag or/and microchip their family will be liable to a heavy fine. Our law also gives them seven days to track and find their missing furry friend. Cat families have no such luxury. Your cat has no legal protection whatsoever and can be rehomed immediately. No heavy fines but something far worst, the possibility of never being reunited with them, so please read on. As no doubt you know since April 2016, it is law that all dogs must be microchipped and since 2007 they should also be wearing an ID tag. The ID tag should have the owner’s contact details, such as address, phone number, postcode and house number. Dogs Trust 2016 survey is the first survey to have the new microchip requirements included. This possibly influenced them to look closely into microchipped stray dogs and we don’t think the result was quite what they expected. The survey shows that the number of stray dogs were down an encouraging 21%. However there were still 81,050 stray dogs recorded by local council dog wardens in the survey as taken in over the twelve month period. Only 54% returned to their families with the others rehomed, passed to other welfare charities or very sadly put to sleep. Not all councils provided details on how the stray dogs found, were returned to their families. Dogs Trust found approximately 61% of strays taken in were microchipped. Of these they found that a QUARTER of them did not have current contact details recorded and could not he reunited with their families. With regards to ID tags, while required by law for many years only 6% of dogs were returned with their families via their collar tag. A further 4% returned through a combination of an ID tag and microchip. At the very most only 10% of dogs returned home with some help from their ID Tag. As for other ways dogs found their way home, 41% of dog families contacted dog wardens and collected their dog while a further 3% of dogs returned because the warden knew who their families were. 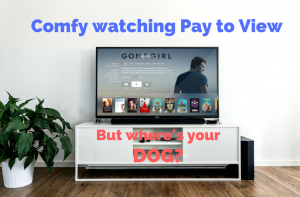 Why is our title “Do not risk losing your dog to watch TV”? Dogs Trust went a little deeper regarding why a quarter of microchipped stray dogs could not be returned. They found many had not remembered to update their dog’s contact details with the microchip company when moving house or changing phone numbers. Even worse a mere 9% of dog owners consider updating their dogs’ microchip details post-move a priority, with sorting digital TV coming above this! While we have no doubt the vast majority of pet owners reading this who have moved will have updated their pets ID tag or microchip contact details. If you have the slightest doubt of this we recommend checking your details now. In most cases the process is easy and quick, check out Pets Bureau’s Premium Pet ID Tag System where you can update your details anytime, anywhere and free of charge. Some companies do charge a very small fee to make any changes, however it’s worth it. Otherwise, you could be sitting comfortably watching your digital TV without your cat or dog beside you, what an awful thought. If you know of someone who may be interested in this article then please share it with them, a little thoughtful nudge may save them a lot of heartache. As a final thought, we highly recommend you microchip and ID tag every furry family member. Happy days from the Pets Bureau Team.